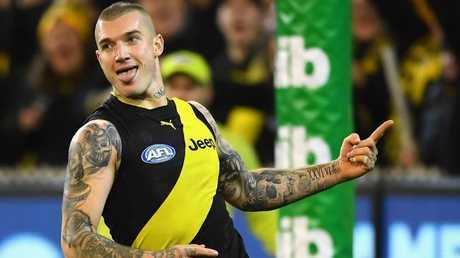 RICHMOND coach Damien Hardwick says his side is no longer reliant on star midfielder Dustin Martin, the Tigers' game-changer for much of last season. Hardwick said Martin was running at "80 per cent" compared to his Brownlow Medal-winning season of 2017 but other players were stepping up to fill the void. 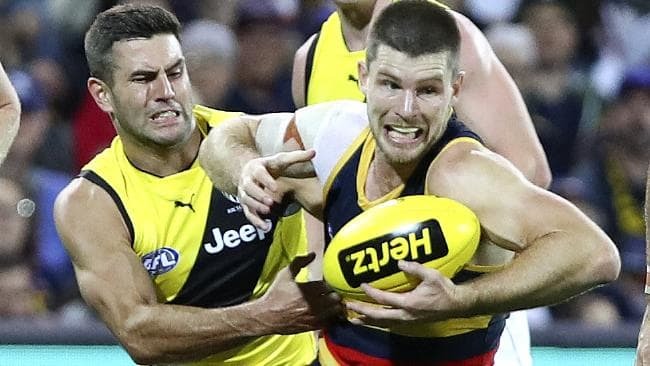 Martin had what Hardwick described as a "fumbly" first half against the Adelaide Crows on Friday night but went on to finish with two goals from 30 disposals, albeit at 57 per cent efficiency. "He was a bit fumbly early but then he got his game up and going," Hardwick said. "He's probably at 80 per cent of his level last year, which is still pretty good, and we're 12-3, so we're winning a lot of games. "The pleasing thing for us is we don't require those guys to be playing at the same level all the time. "The majority of our leaders had outstanding years last year, they've had really good years this year as well. "But the progression of guys like Nick Vlastuin, Kane Lambert again, Dylan Grimes, David Astbury, just to see those guys stand up, that's what makes a really good footy side and that's what we've become off the back of those players. "I think every player had a moment tonight, which was great." Hardwick said setting new records for consecutive games won at the MCG was a bonus but far from a focus ,after the Tigers logged their 17th win in a row at the venue. "To be fair I'm not a real record type of guy," the coach said. "It's not something we really worry about too much. It's something that's talked about in the media but I'm just happy we're 12-3." 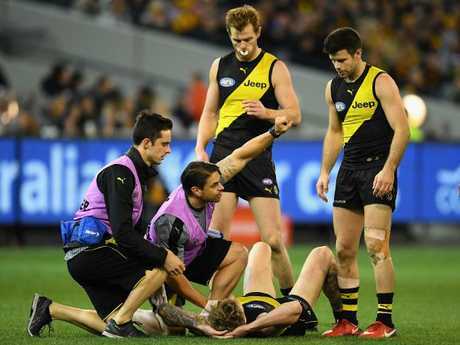 There were some sour notes out of the 47-point win for Richmond, with three players finishing the game injured on the bench. Jack Graham will have scans over the weekend on a dislocated shoulder and Nathan Broad suffered a depressed fracture of the cheekbone that will sideline him for some time. Dan Butler re-aggravated an ankle inury he had been carrying but was able to return to the field.